Sadly, I am still missing one of my creations. 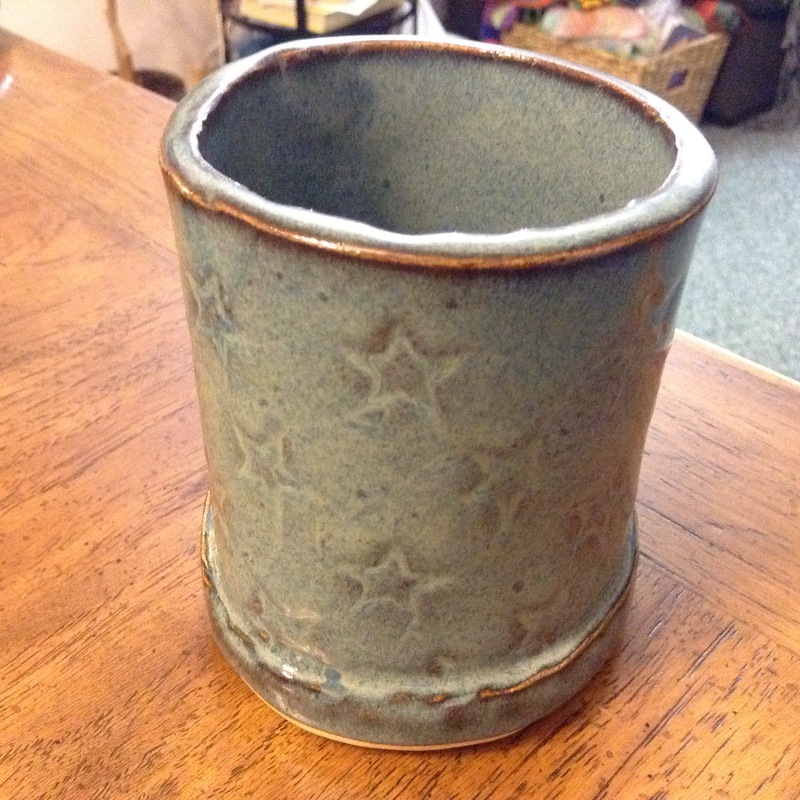 I just couldn’t find it anywhere at the studio so will have to talk to the owner and see if she knows where it is. The majority of my pots are now home, however. 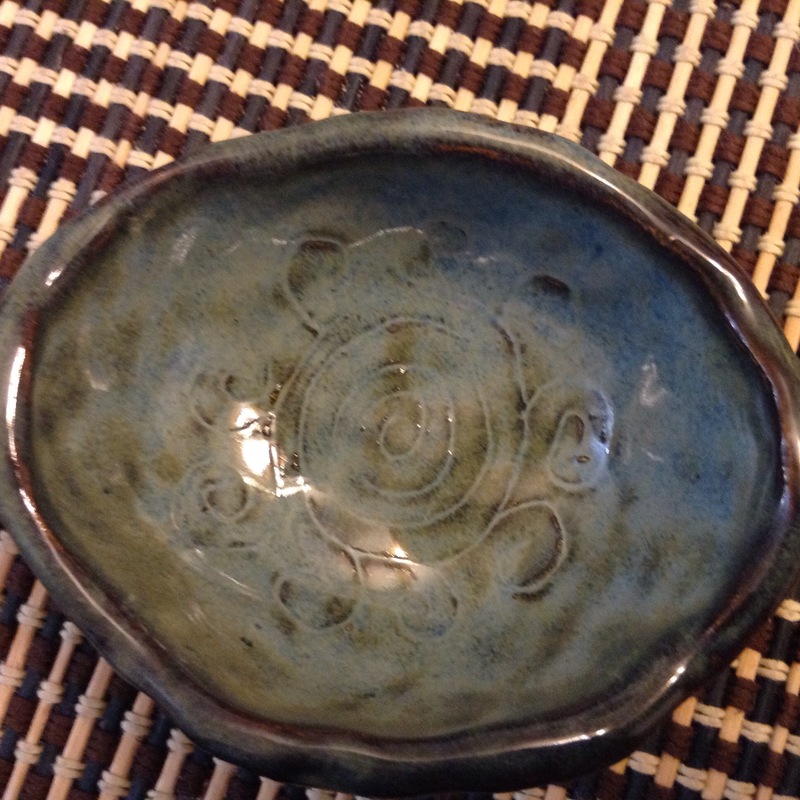 These two little bowls were the absolute end of my clay and I was just doing my best to finish it up. 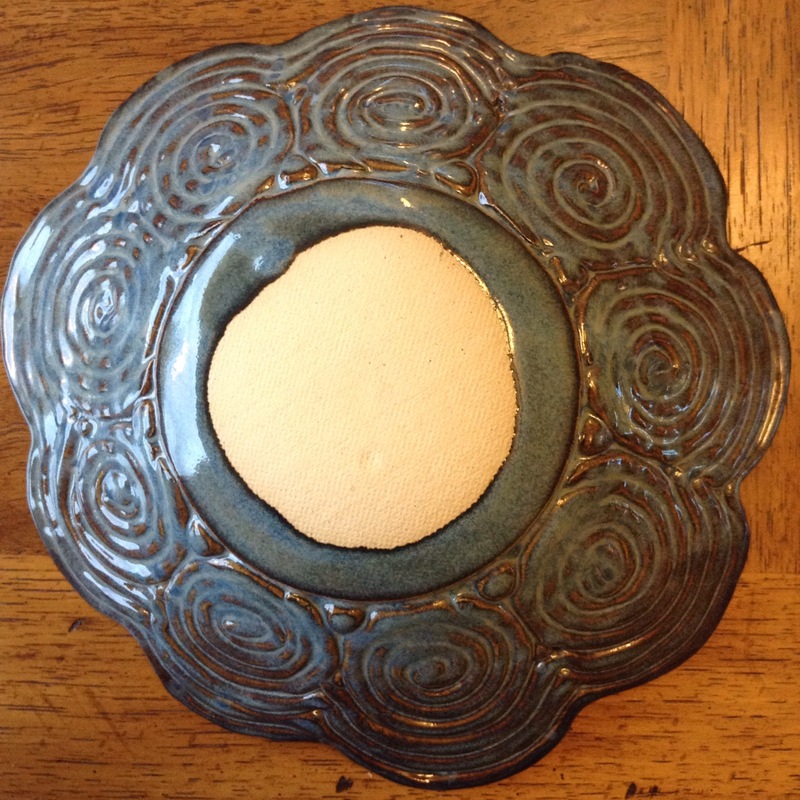 One of these is a spoon rest and the other is a two-part soap dish. 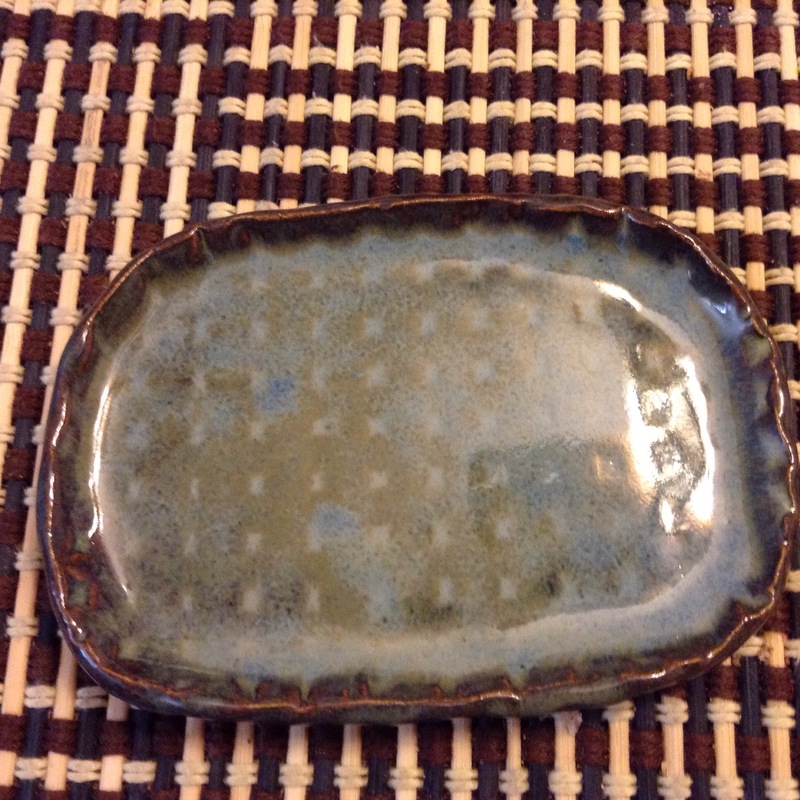 I think this one will work better than my oval ones, which are too flat to stop the soap from sliding off. Learned a good lesson there! 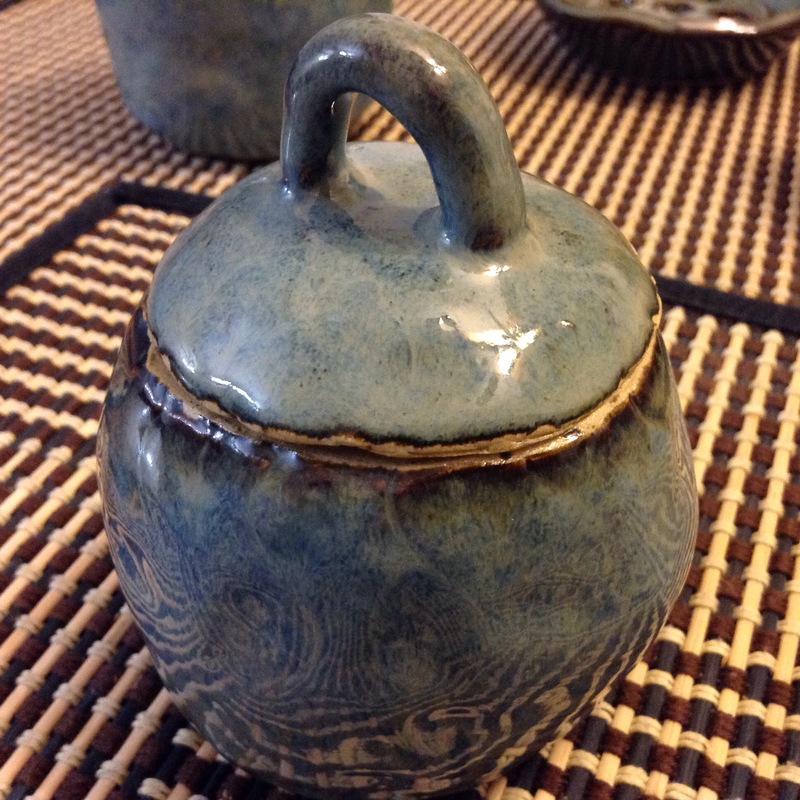 These two are pinch pots with lids. The edges look a little messy as I had to apply wax to the surfaces that touch. 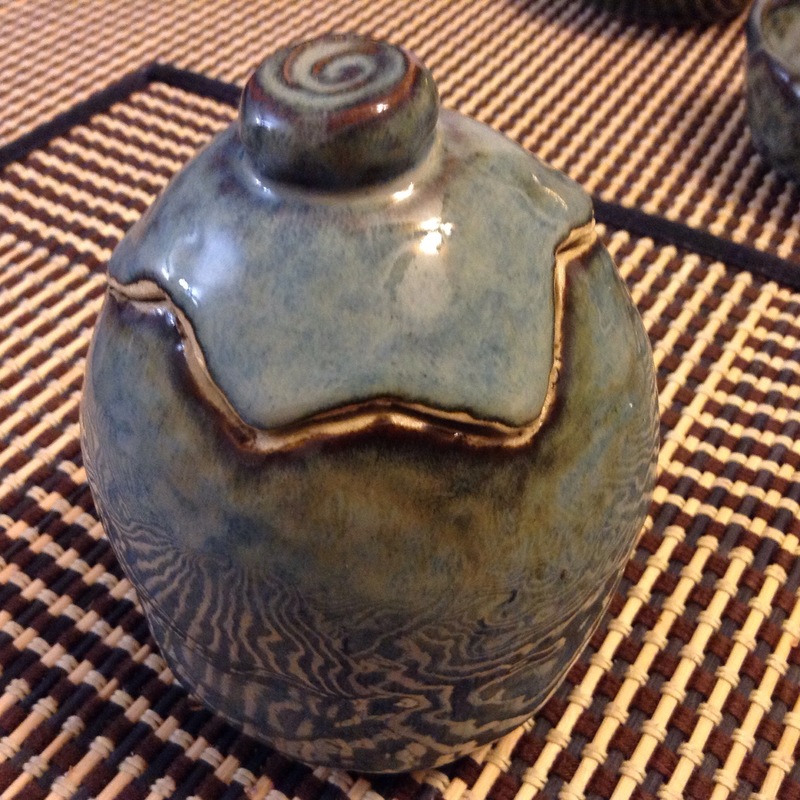 They are fired with the lids on to retain the shape. The one with the solid knob on top is what I call my dragon’s egg. 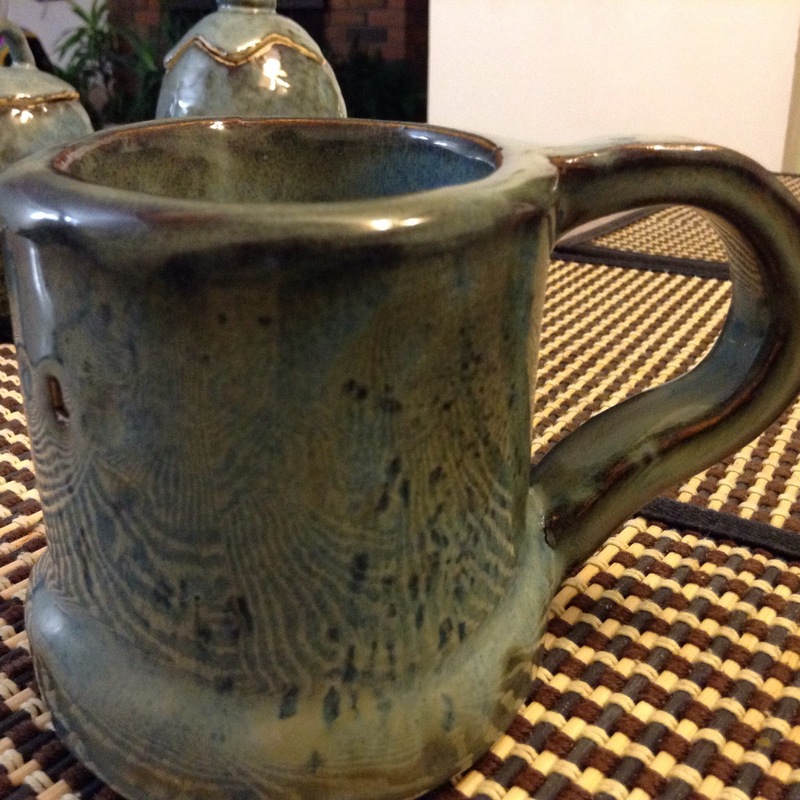 Two shots of the mug. This is the one that had the pasta letters pressed into the side. Most of the letters are just visible though the glaze rather filled them in. The L of “Nicola” is most obvious as there seems to be no glaze in it at all! And finally, the kitchen caddy. It has a teeny holder at one end for my Lee Valley cleaning brushes (they are like mascara brushes for cleaning straws etc). The flat area will hold a wire soap pad and a nail brush, and the tall section will hold a brush or sponge. I haven’t tested it yet. The construction of the tall part was inspired by a library book photo. It’s just a rectangle curved into an S shape and joined. I am enjoying using what I made. Every day when I use my toothpaste I admire my little pot, and yesterday I had three balls of yarn in the yarn bowl with the strands feeding through the spiral. 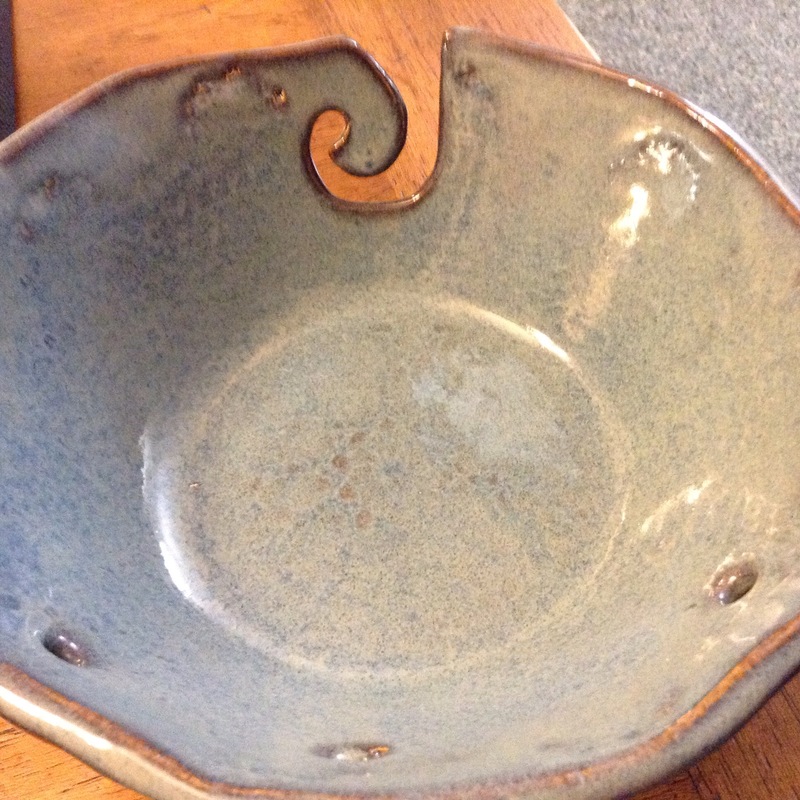 Looking at this bowl from above, it’s pretty, but the magic is underneath. The construction was fun. 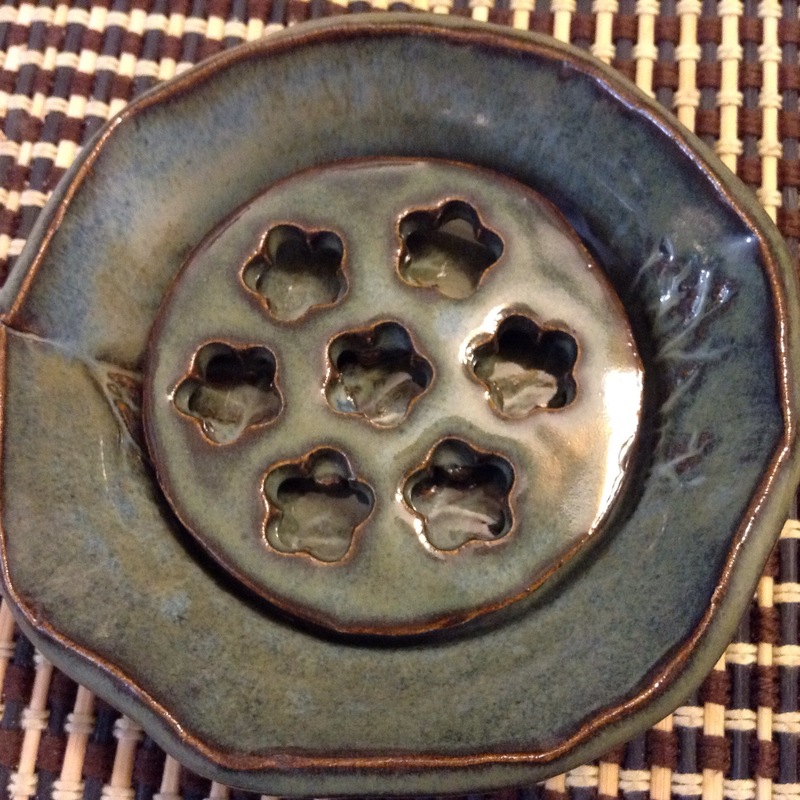 I cut out a circle and placed it inside a bowl mould. Then I made coils – the sort of thing I used to make as a child out of Plasticine (do you remember that stuff?) Wormy coils in spirals placed against the initial circle, then little blobs to fill in the gaps, and three rows of more worms all around the edges. 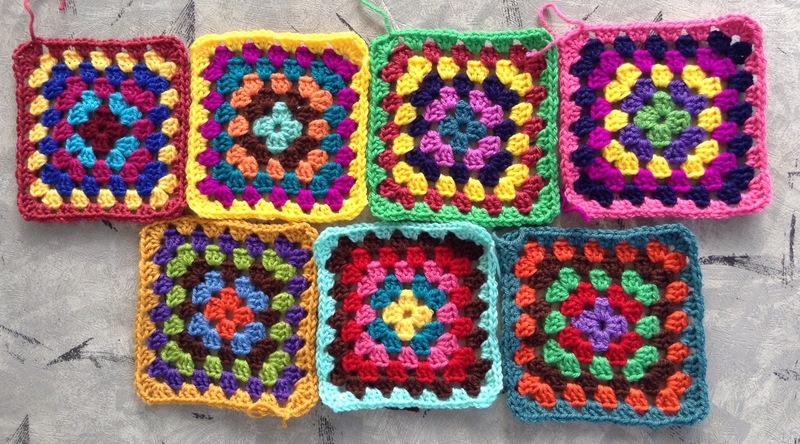 A bit like making a granny square blanket, putting the squares together, then crocheting a border. After all that was done, the inside was smoothed out so that there were no holes. 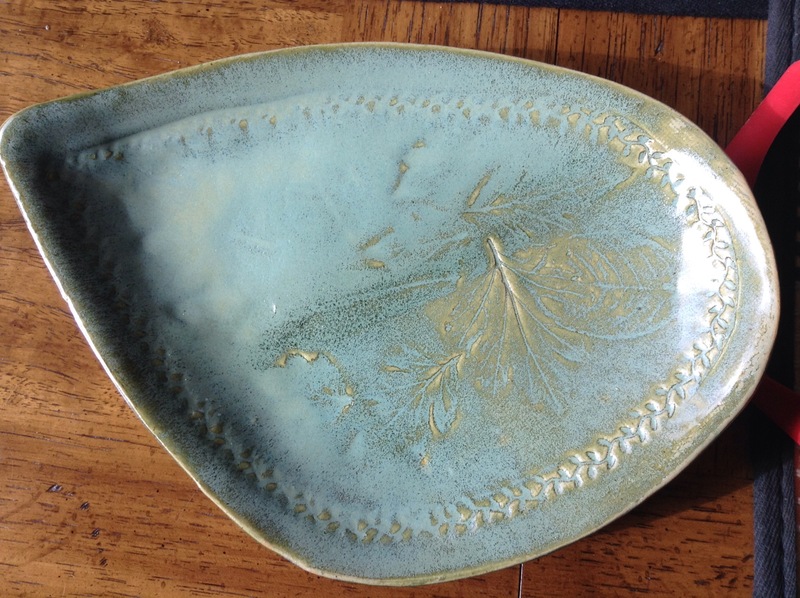 The Floating Blue glaze again brilliantly highlights the texture. 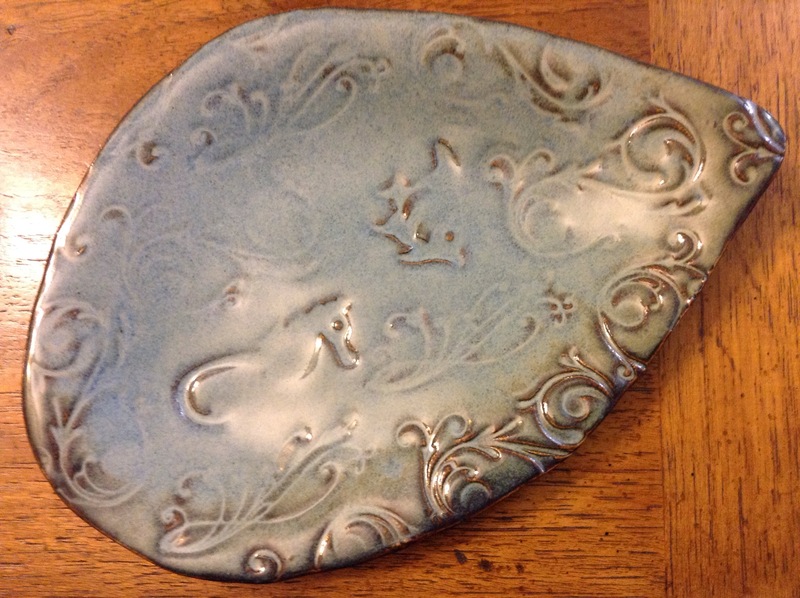 The only other item that I was able to pick up today (the rest are still sitting in the kiln room awaiting their turn) was this spoon rest for my kitchen. I just brought this home. 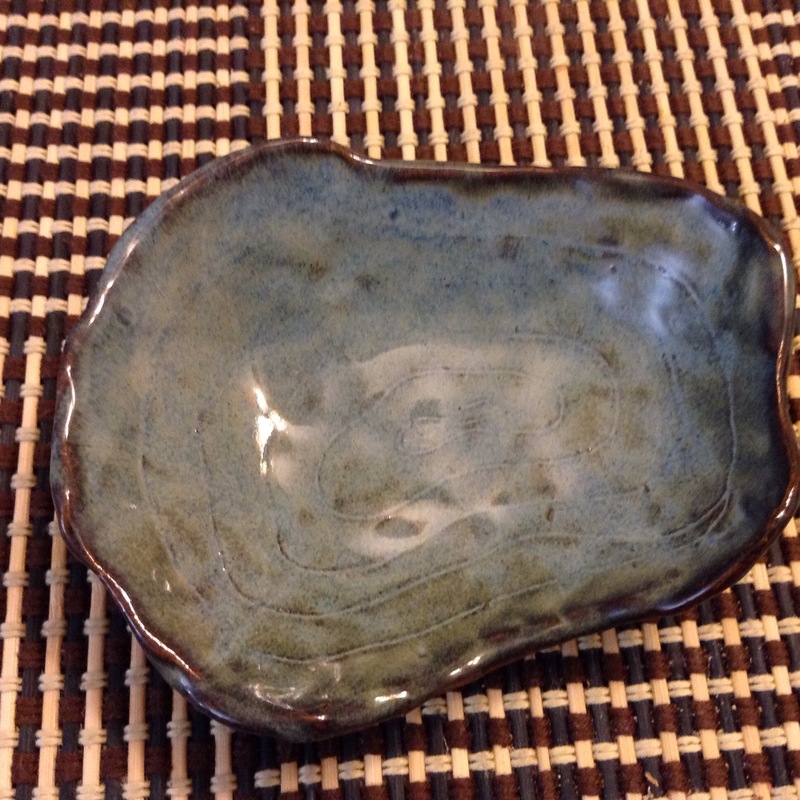 It’s the first piece I dipped in glaze and I overdid it somewhat. 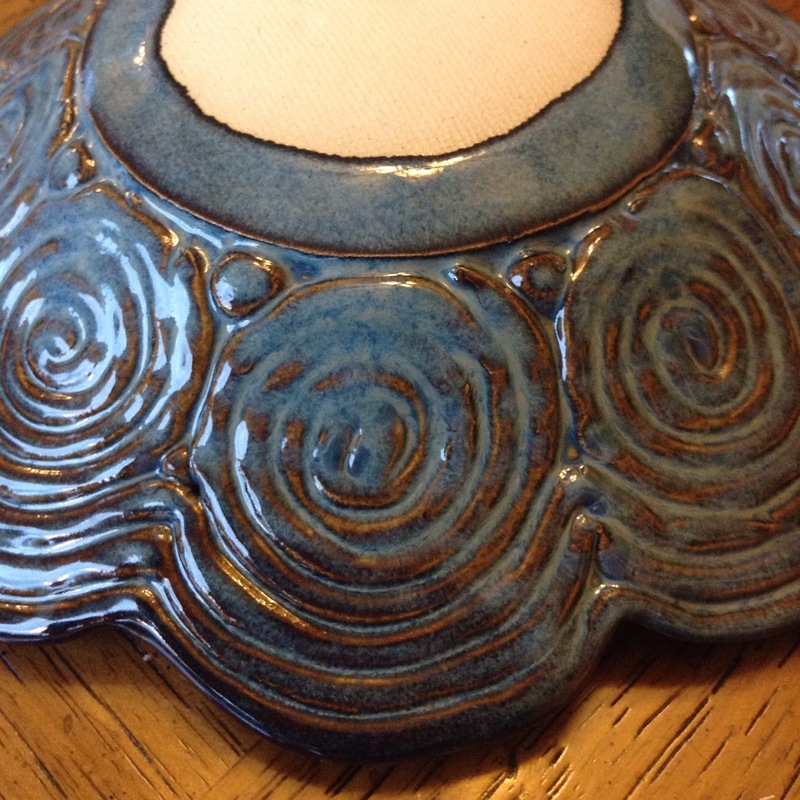 I have discovered from this glazing process that fine texture and small details can be lost when the glaze (which is really very dilute clay) is added. 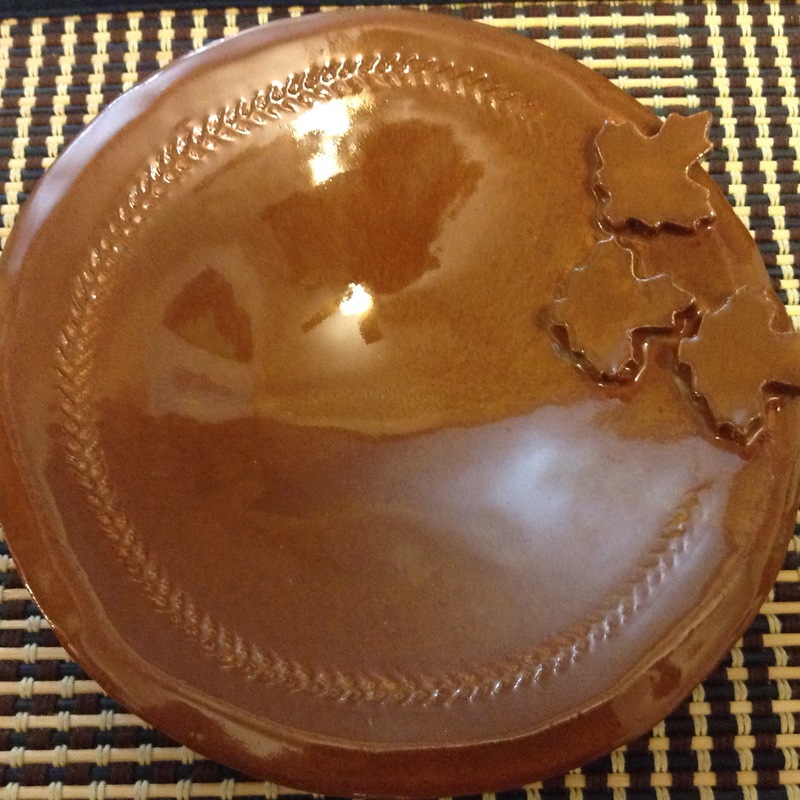 The leaf stamps I used on this plate can be seen on the wide end, but not on the narrow end. I have many more items to show you, but that will be in a few days’ time, as I just dipped them in Floating Blue this morning. Bonnie at the studio assured me they would be fired this week. 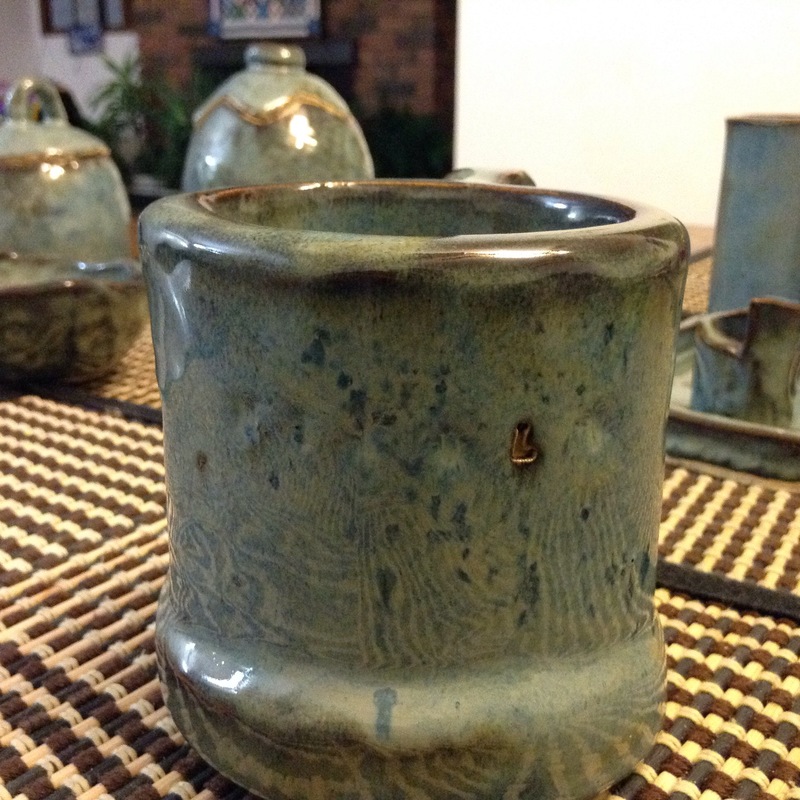 Obviously it depends on the kiln space and quantity of other people’s stuff that needs firing. Teaching knitting/crochet again at the library this afternoon, this time with more helpers. Should be fun! 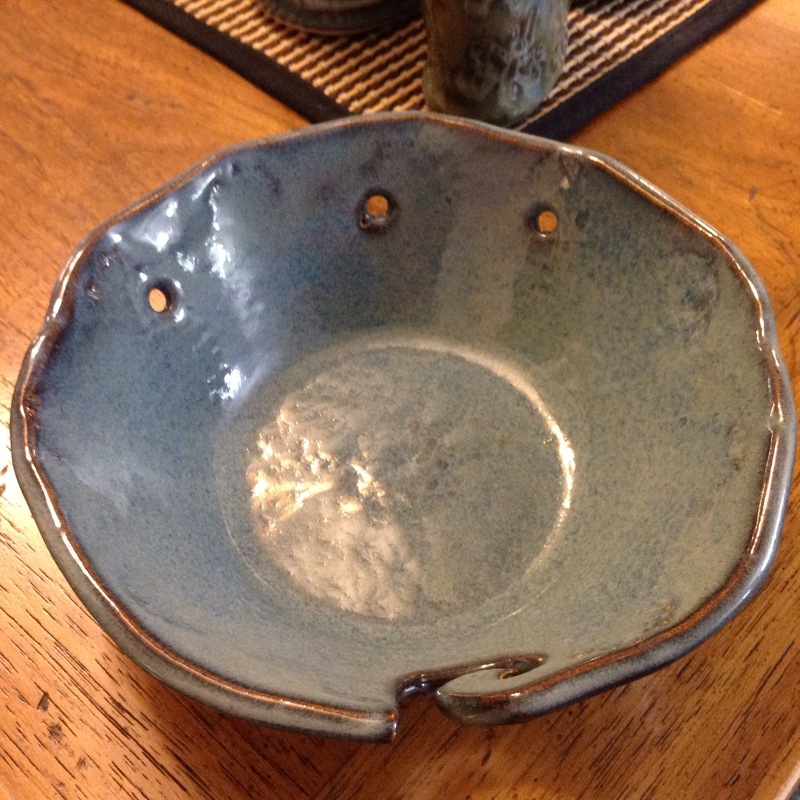 We had a choice of three glazes – one looked terracotta in the bowl, but turns out blue with brown highlights on the edges/texture; one was pale green and looks pretty much the same when fired; and the third was a reddish brown but not as deep as the blue, and produced a rich brown. 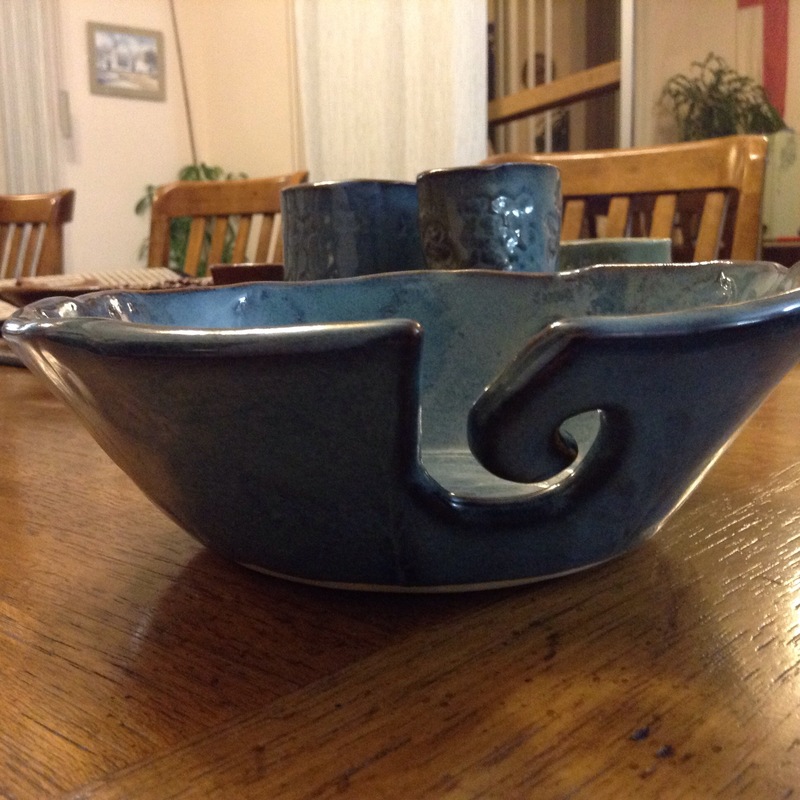 So here are some random pots and bowls, plus two soap dishes. 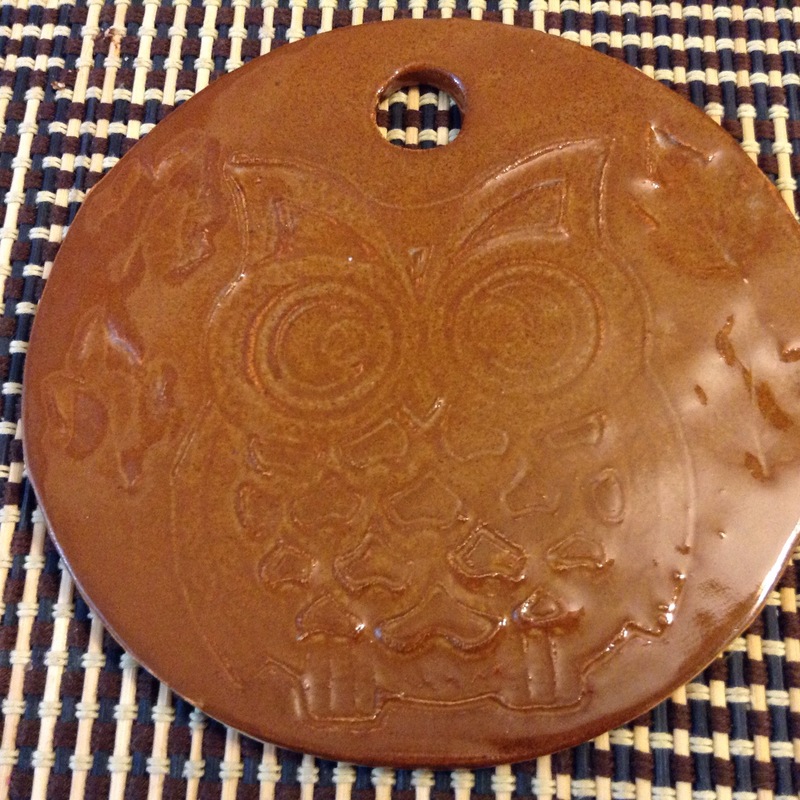 And an owl plaque. 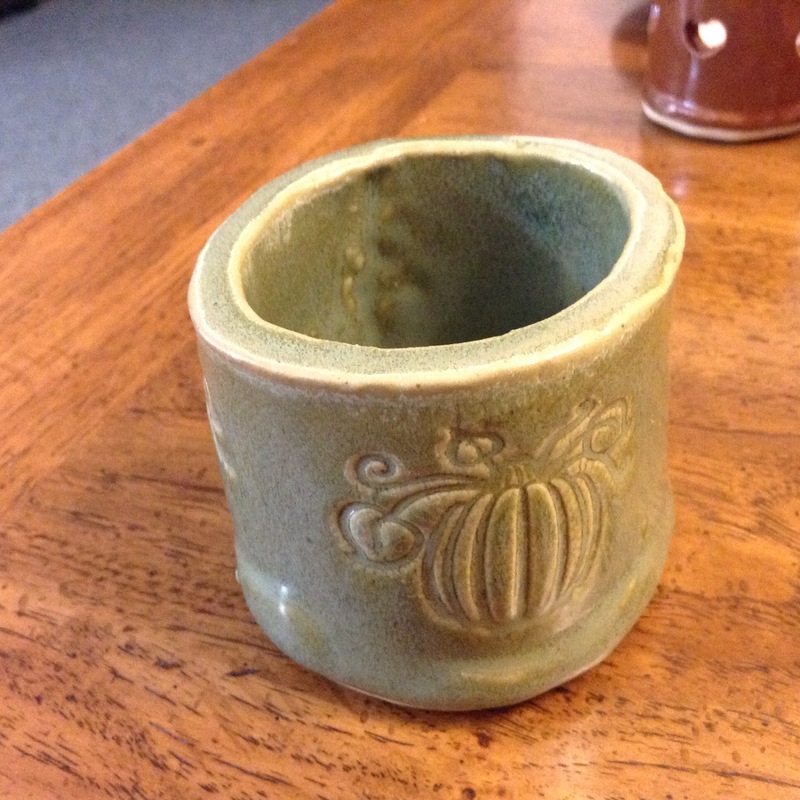 I stopped by the pottery studio a couple of days ago and picked up the glazed pieces that ds2 and I had made. 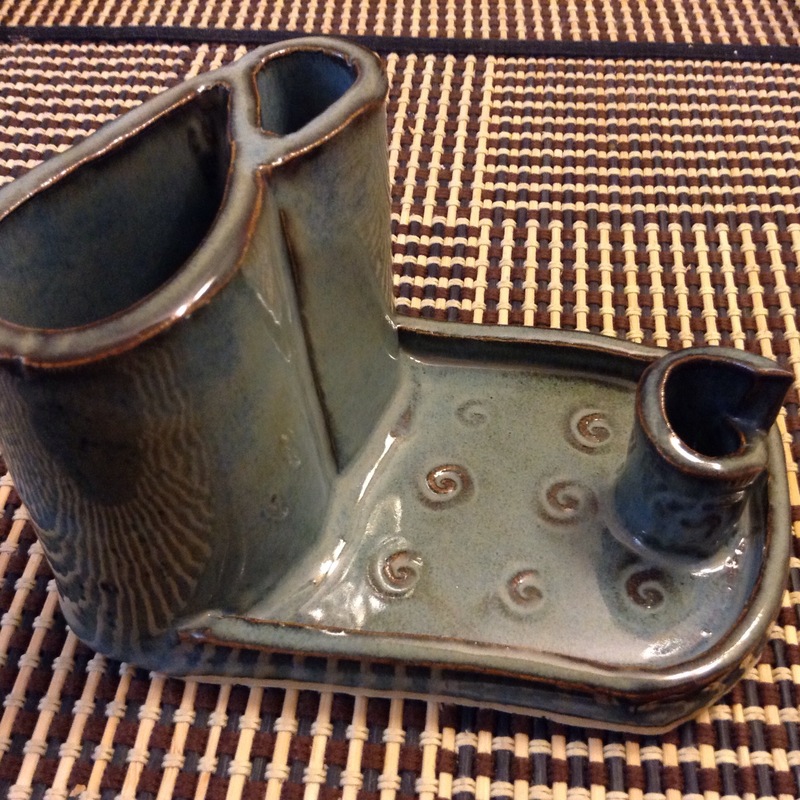 There are two items missing so I’m hoping they didn’t get broken in the second firing. And I still have a lot more to glaze. Great progress today. Two squares finished, and that’s even with me getting my housework done and going out to the pottery studio to glaze some of my pieces. (I took my iPad but completely forgot to take photos.) 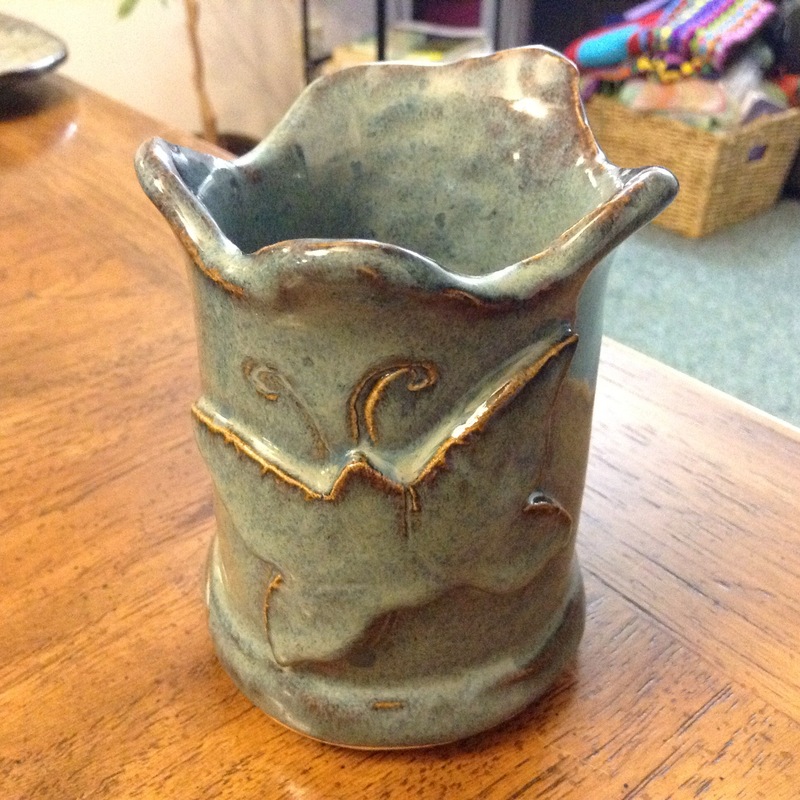 I still have some items unfired so will have to return to glaze those later. These flowers aren’t really shown in their true colours. 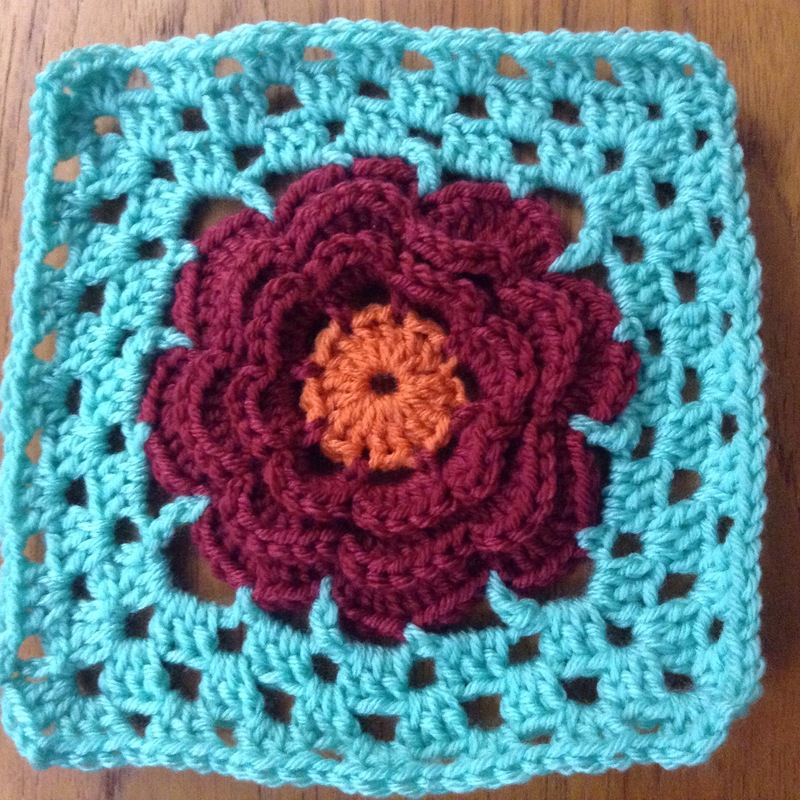 One block is teal, pink and royal blue, the other is orange, cranberry and a minty green. I’m going to lay everything out on the floor and see how it looks to get an idea of the size. 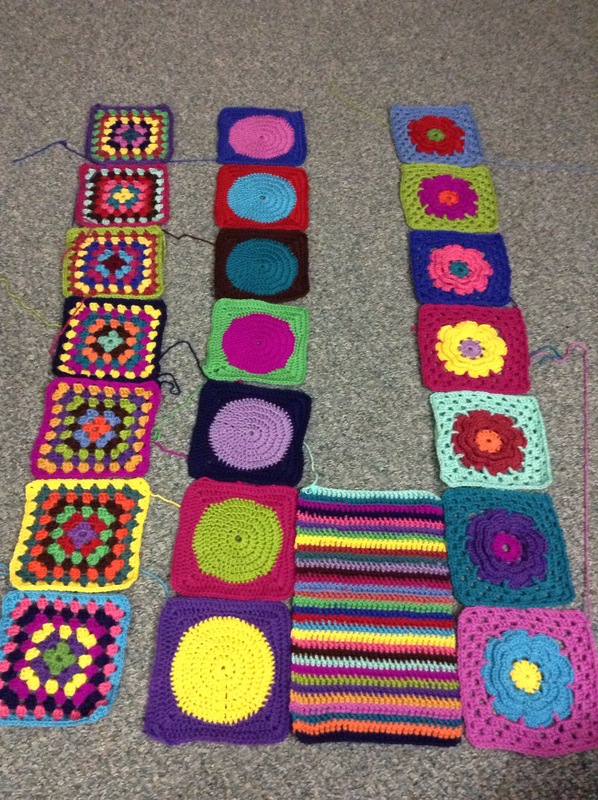 Edited to add: here are the 21 blocks laid out quickly, in no particular order, with the partial stripe strip. It’s interesting to get an overview. And finally, a winner has been drawn for the 100-follower giveaway. A long-time follower of my blog, Crafty Gardener, has won and expressed an interest in the green headwrap. I have contacted her via her blog to let her know. I had a crafty day today. 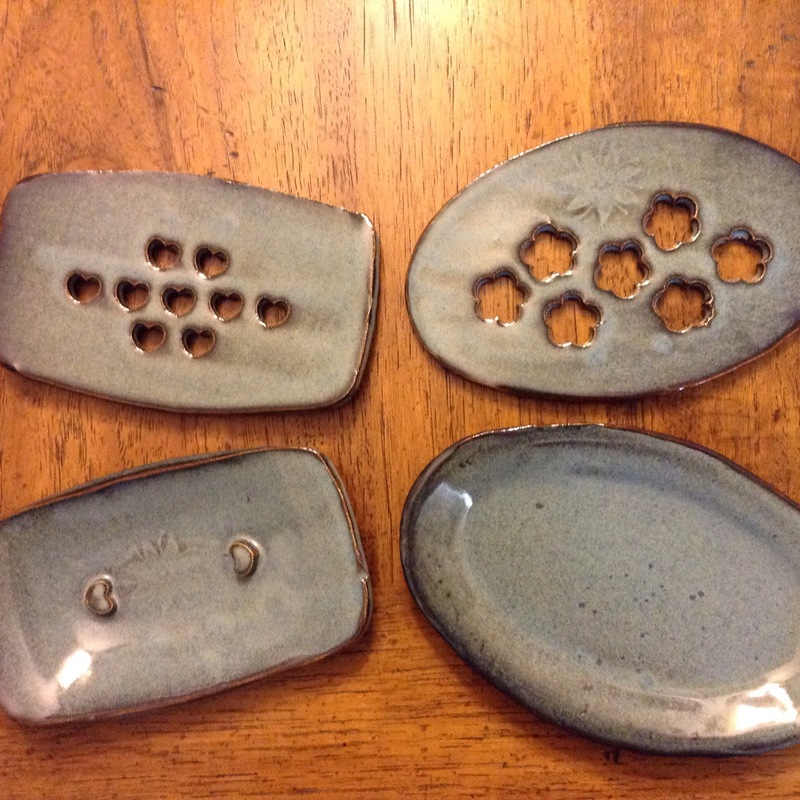 I went to the pottery studio to use up the last of my and ds2’s clay (made a few small things including a couple of spoon rests and a pot for Tai Chi Man to use in the bathroom for his toothbrush) this morning. 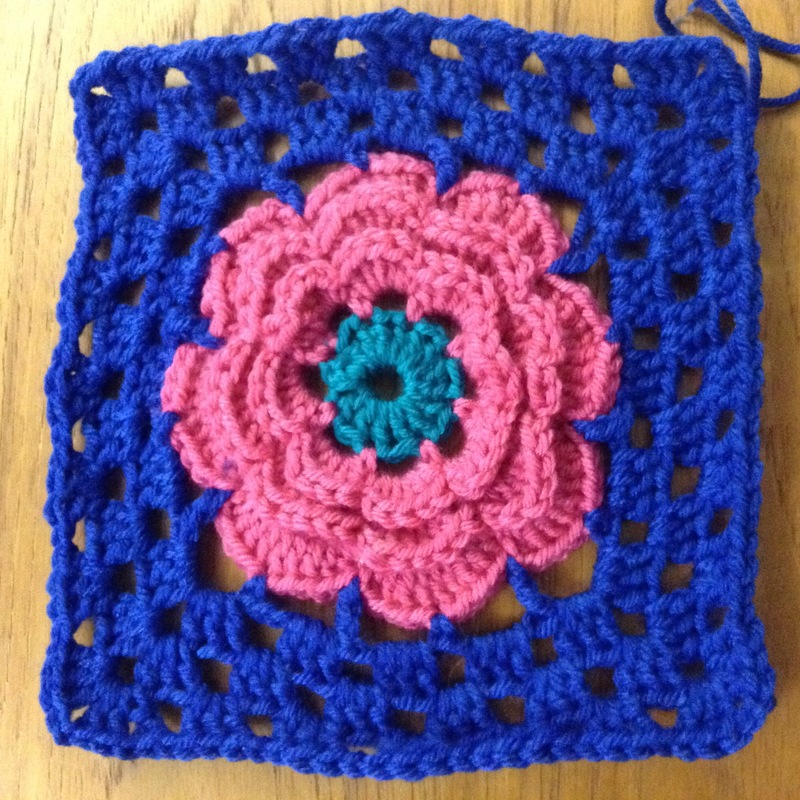 And the afternoon was the weekly library drop-in at which I finished another flower square for the Groovy-scrap-ghan and added 8 more stripes to the stripe strip. I’m looking forward to glazing night tomorrow, and when it’s all been fired I can bring it home, get it photographed and blog about it! I think I shall have to get Tai Chi Man to use his decent camera for the photography, as the iPad has only limited abilities. I’ve had very few responses to my giveaway offer of a few days ago so this is just a reminder to comment on that post to have a chance to win. All my grannies now have six rounds – only one round to go on each. 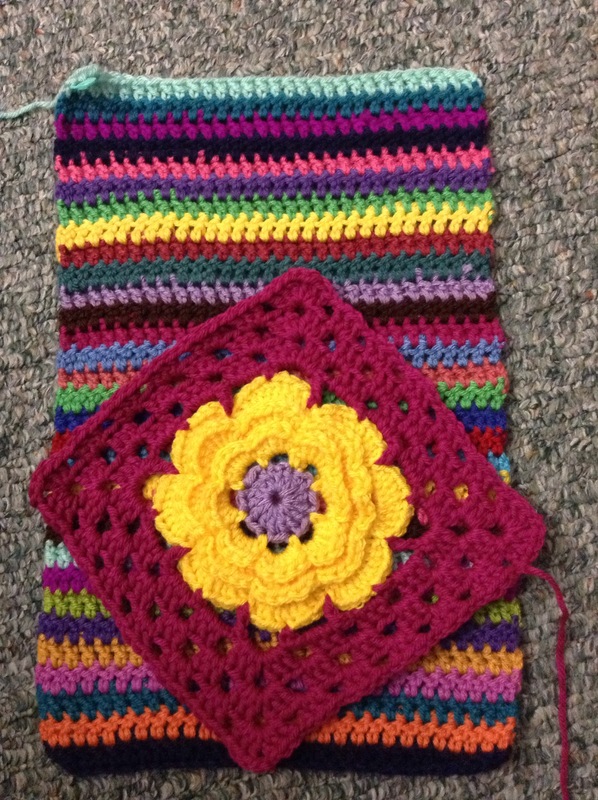 I still only have one flower block, but there are five dot blocks done, the latest being the yellow and purple. 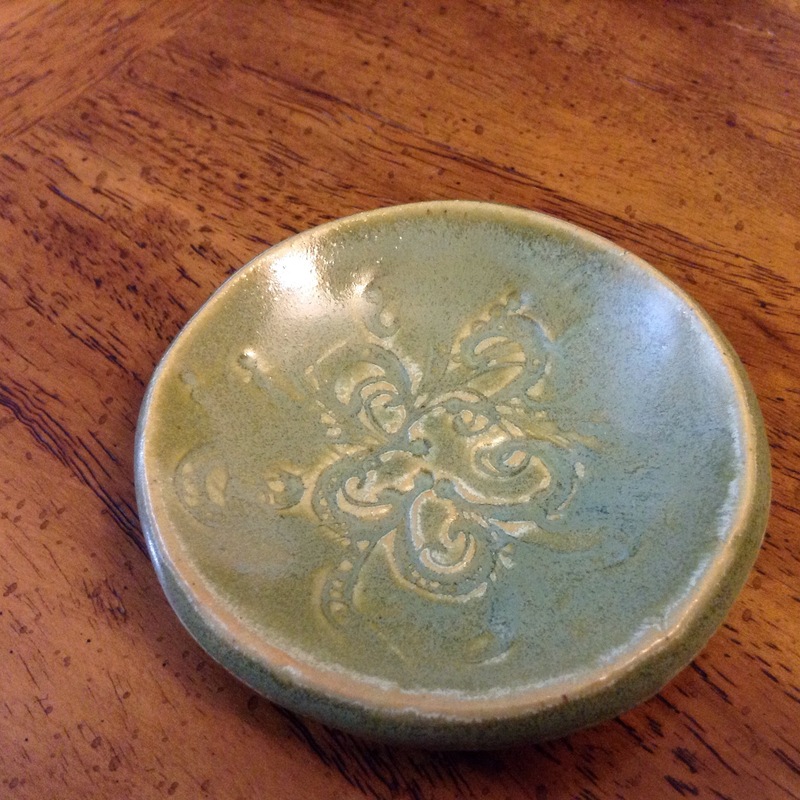 I did also make five 4″ diameter coasters for my oldest son’s desk in bright colours, at his request, but didn’t take any photos. And as I am planning to help teach crochet and knitting at the local library this fall, I also made some teaching aids showing different stitches and methods of crochet. 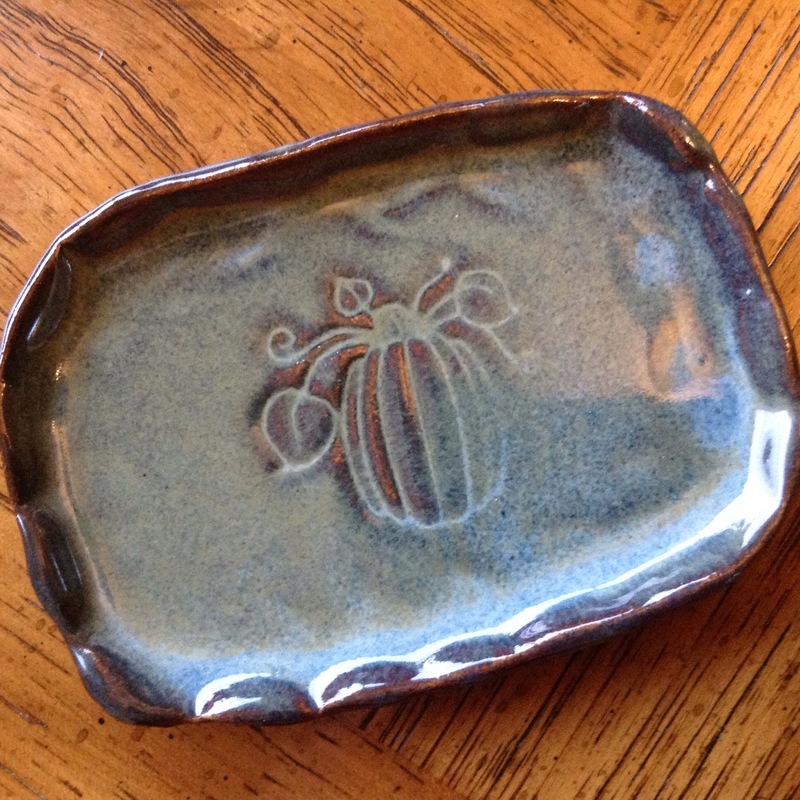 I’ll be going to the pottery studio shortly, arriving a couple of hours before the scheduled class time so that I can get started on some new projects. It’s a ‘make whatever you like’ class, as next week we glaze. I saw an idea on Pinterest for pressing alphabet pasta into the clay, which then burns off in the kiln to leave the impressions of the letters. If they don’t mind me trying it, I’m going to do it – I have some teeny alphabet pasta in the house and I’m taking it with me. 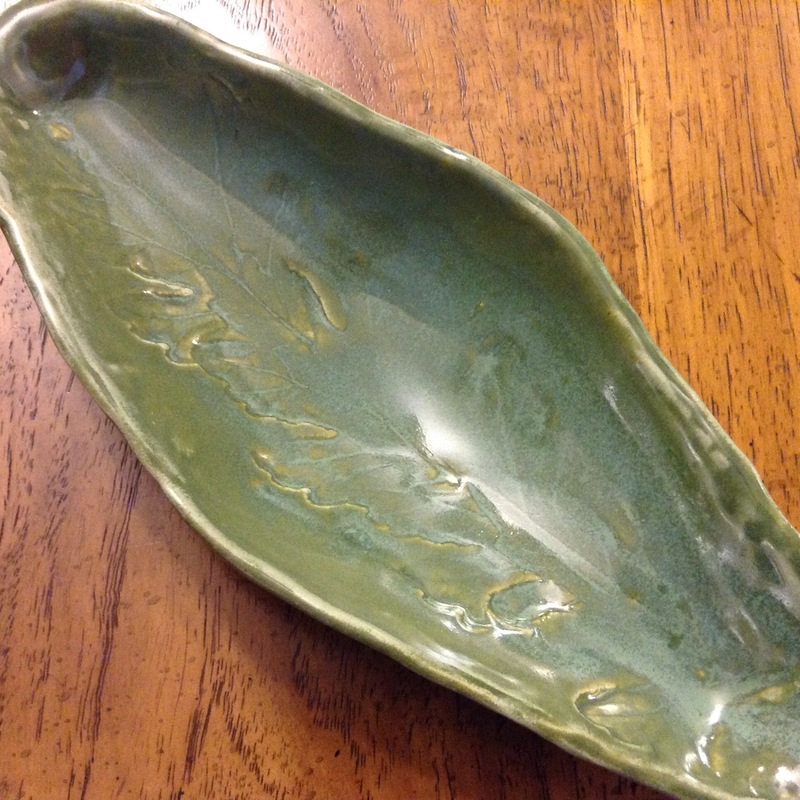 My plan for tonight is to make another soap dish and some sort of caddy for my kitchen that will hold the sponge, nail brush, etc. It’s been a beautiful week weather wise, with a temperature yesterday of 21 officially but felt much warmer when I was out walking, and today is mild with diffuse sunshine and still good for having the windows and kitchen door open. Love all these colours. 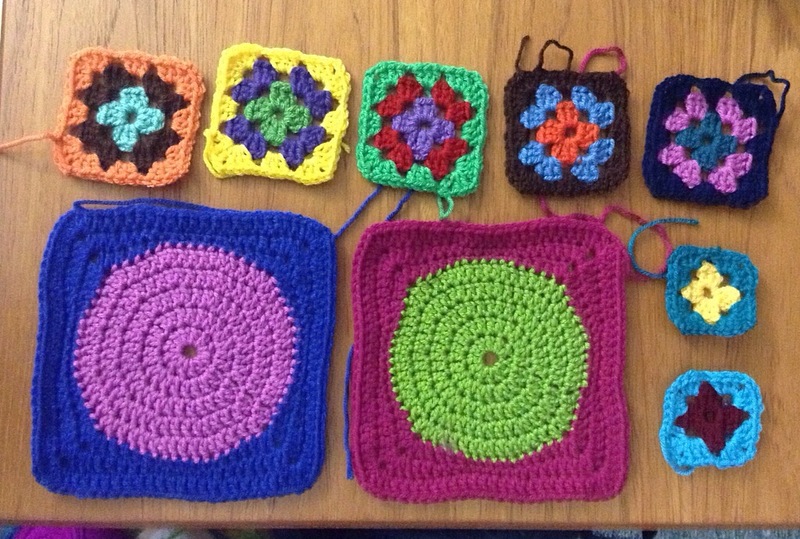 Yesterday I started on the seven granny squares, each of which has seven rounds. Working them all concurrently so at the moment five have three rounds each and two have only two. I have the colours decided for the third rounds. The two dot blocks were started at Knit ‘n Chat at the LYS this morning. Met a friend there, then went on to a coffee shop. I don’t think my iPad does the colours justice. I don’t want to feel like I’m rushing this project so I’m going to stop for tonight and read a book instead. My left little finger is feeling a bit stiff anyway. 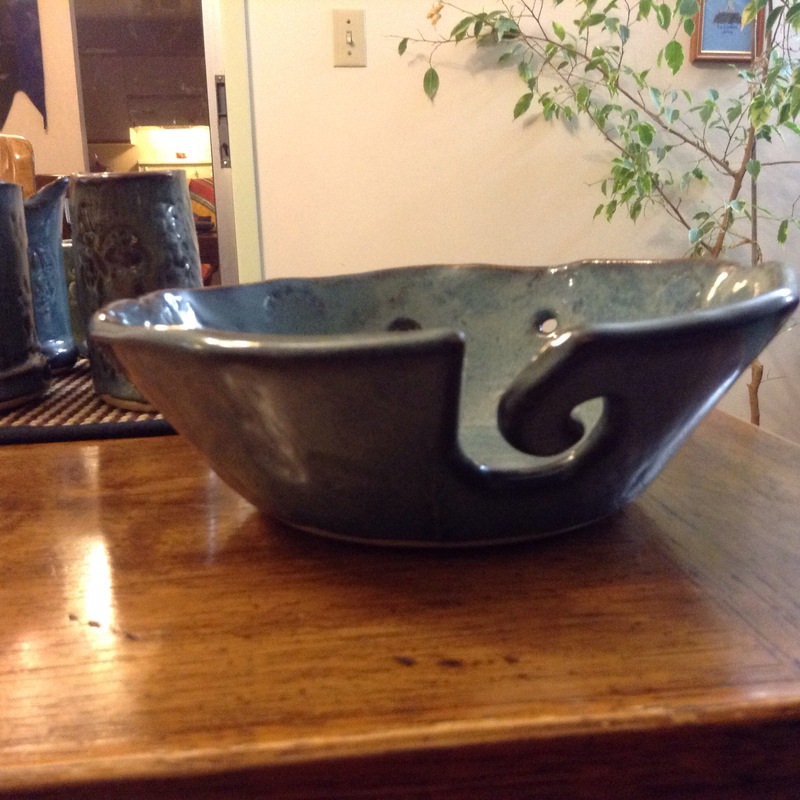 Last night at pottery class, I learned another new technique. 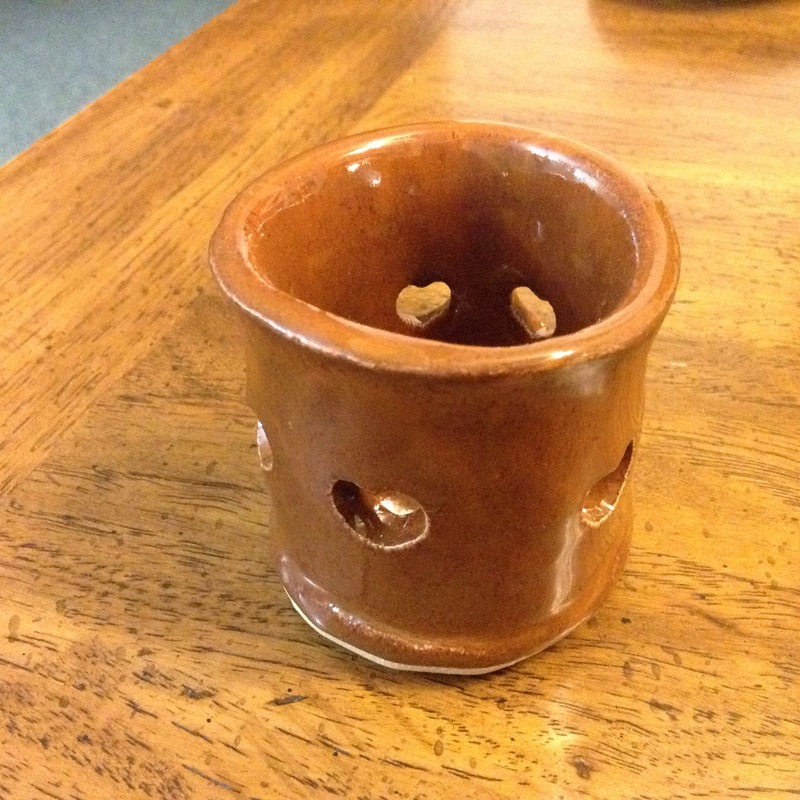 Pinch pots. I made something that sort of resembles a dragon’s egg (I hope) and I wish I was capable of making something that actually looked like a baby dragon to go inside it, but I’m not there yet! Good grief, I wish I hadn’t updated this iPad to iOS8. So many new glitches have appeared that outweigh any possible benefits. Anyway I digress. 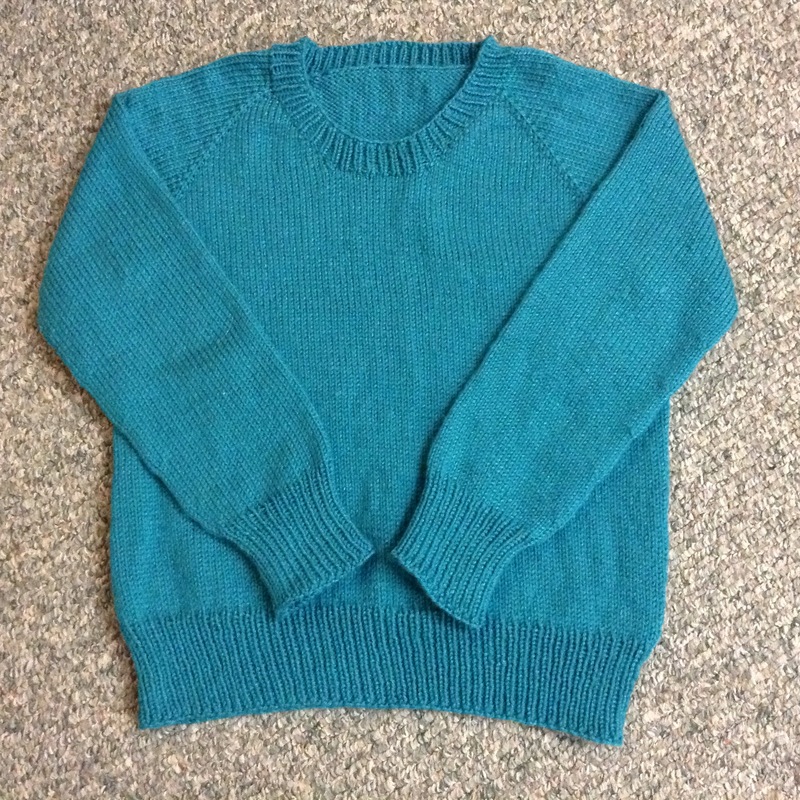 The sweater is finished, though not yet washed. In the end I used less than five balls of Willow Wash in Aruba Blue. And now I can start a brand new project. Exciting! 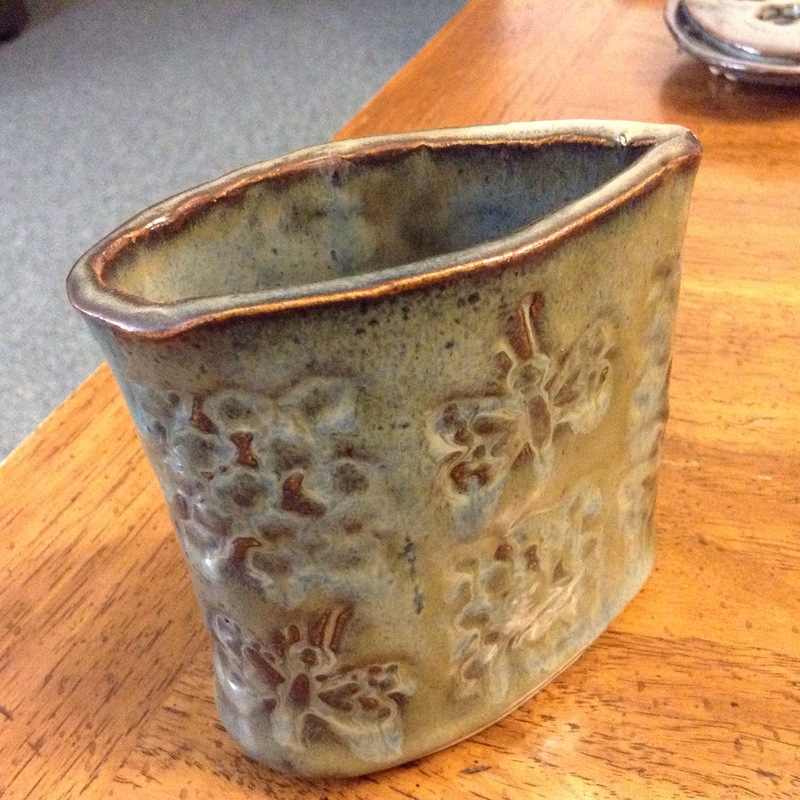 In a couple of weeks, I will be able to show you the fruits of my new hobby, pottery. I’ve had two lessons out of five so far, but have also made extra visits to the studio in between, and have hand built 15 items so far. Definitely enjoying it and can’t wait to see them glazed. Right now, they are looking grey and dull, but the firing will fix all that. 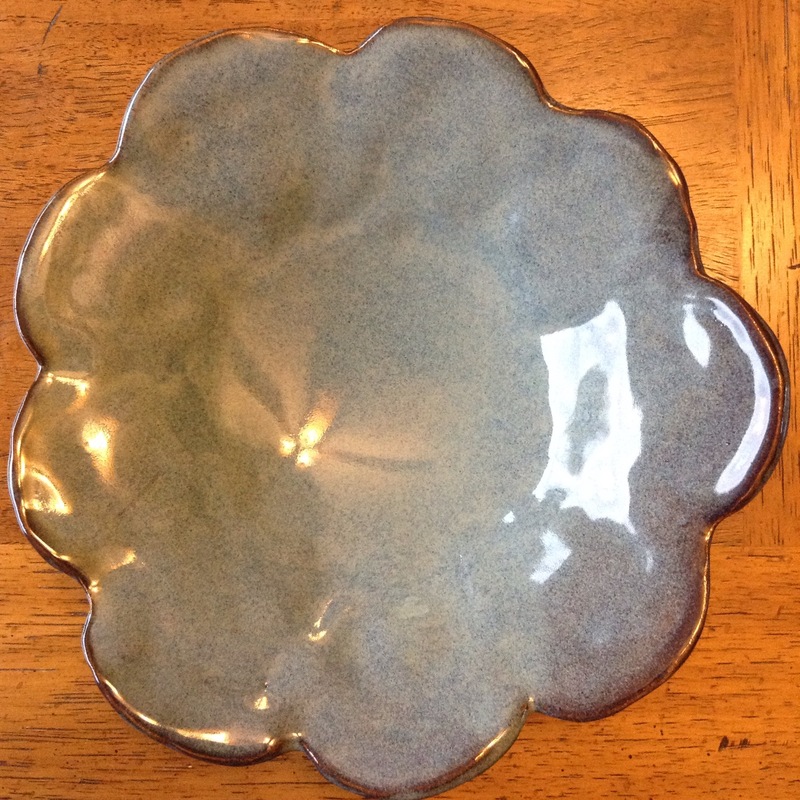 As soon as I bring my pieces home, I’ll get photos of them in all their wonky amateurish beauty! !